We are all familiar with terrestrial tropospheric weather. It is what we experience all around us; our atmospheric environment. It may be fine, cloudy, stormy or sunny. It may rain or hail. We know about temperature and pressure and humidity. This is all about weather in the lowest 10 km of our atmosphere. As we go out into space, the atmosphere becomes very thin, until by the time we are in space, it has almost vanished. Almost, but not quite. Even in space there are some atoms which are often moving very quickly. Many forms of energy also move through space and it is the interaction of energy and atoms that produces what we refer to as space weather. In particular, space weather is the changes that occur in the space environment. The Sun is the source of 'normal' terrestrial weather. It is also the primary (but not the only) source of space weather. The "solar wind" from the Sun streams past the Earth and is mostly deflected by the Earth's magnetic field. But variations in the solar wind cause changes in the Earth's magnetic field. Sometimes these changes are gradual increases in density or velocity. Sometimes they are huge clouds of atoms preceded by a shockwave (a little like an ocean tsunami). The aurora results from the passage of the solar wind past the Earth. Occasionally a huge release of magnetic energy, called a solar flare, occurs on the Sun. Flares can produce large quantities of x-rays which affect the Earth's atmosphere. They can also accelerate atomic particles (mostly protons) to very high speeds (a substantial fraction of the speed of light!). These high energy particles are dangerous to man and can reach the stratosphere where jet aircraft fly. 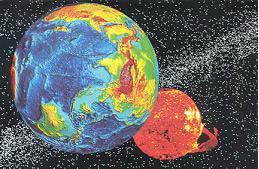 Apart from emissions from the Sun, space is filled with galactic cosmic radiation and pieces of space debris. Small pieces of natural debris are termed meteoroids, and when these hit the Earth they produce meteors - streaks of light in the night sky. Larger pieces of space rock can be damaging to satellites and even, if large enough, to man on the Earth. Most aspects of space weather affect us to some extent. The more our society becomes dependent on technology and the more we utilise space, the more we are affected by space weather. Some aspects of space weather are benevolent, and allow activities not otherwise possible such as long range radio communications. Some aspects are benign but fascinating such as the aurora, and some are malevolent. Like terrestrial weather, it sometimes depends on the situation and the event.